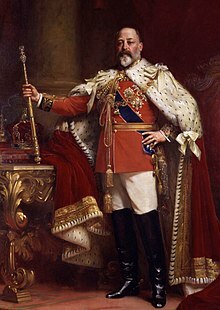 Edward VII (Albert Edward; 9 November 1841 – 6 Mey 1910) wis Keeng o the Unitit Kinrick an the Breetish Dominions an Emperor o Indie frae 22 Januar 1901 till his daith in 1910. He wis the first Breetish monarch o the Hoose o Saxe-Coburg an Gotha, which wis renamed the Hoose o Windsor bi his son, George V.
Afore his accession tae the throne, he served as heir apparent an held the title o Prince o Wales for langer than ony o his predecessors. Durin the lang reign o his mither, Queen Victoria, he wis lairgely excludit frae poleetical pouer an came tae personify the fashionable, leisured elite. The Edwardian era, which covered Edward's reign an wis named efter him, coincided wi the stairt o a new century an heraldit signeeficant chynges in technology an society, includin pouered flicht an the rise o socialism. Edward played a role in the modernisation o the Breetish Home Fleet, the refairm o the Airmy Medical Services, an the reorganisation o the Breetish Airmy efter the Seicond Boer War. Edward fostered guid relations atween Great Breetain an ither European kintras, especially Fraunce, for which he wis popularly cried "Peacemaker." Macaulay, James (editor) (1889). Speeches an addresses o H. R. H. the Prince o Wales: 1863–1888 Lunnon: Murray. Debatable or disputit rulers are in italics. This page wis last eeditit on 28 September 2018, at 06:08.